With positive remarks from Nick Barnard on this release (see review), my confident high expectations of this disc were realised from bar one of Bartók’s Sonata for Solo Violin. This is a substantial piece and punishingly difficult to perform well. 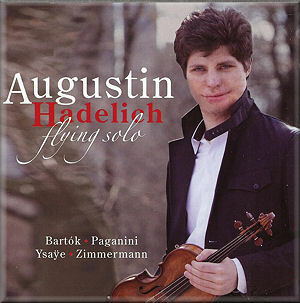 Comparing Augustin Hadelich’s recording against that of Kurt Nikkanen on the alas now defunct Collins Classics label shows him closer to the microphone and revealing even more detail than the earlier account. This has a feel of immediacy and daring, and shows the sheer menacing complexity of the second movement Fuga. Hadelich plays with poise and élan, giving plenty of character to the music as well as surmounting its technical demands. The soulful Melodia is beautifully expressed, and Hadelich’s opening of the final Presto really gets under your skin, the close intervals rising and falling like a sinister insect. There is mention of a warm and resonant acoustic in this recording, and no doubt the LeFrak Hall is an excellent concert venue. I do however suspect some electronic jiggery-pokery with the resonance. Hearing Hadelich’s staccato notes and pizzicati ricochet back as loud as they were played in the first place suggests someone has been a mite over-enthusiastic with the studio reverb circuits. This is not too disturbing however, and the selection of Paganini’s Caprices makes for a bit of romantic relief between Bartók’s grit and Ysaÿe’s intensity. If I have any comment on the Paganini it is that there might have been a bit more playfulness. Hadelich digs deep which is good, but sometimes some more skittish wit might have shone more light on the alchemic wizardry in these pieces. I was intrigued to put Hadelich’s recordings of the Ysaÿe sonatas against those of Henning Kraggerud on Simax (see review). Kraggerud takes a good minute longer with his Sonata No.3, and is incredibly intense and explosive in his dynamics. Hadelich also has plenty to say in this piece, and the change-notes audible 0:13 to 19:00 seconds in, the little notes which occur as an acoustic effect below those of the double-stopped actual notes, immediately made me sit up and take notice. Hadelich has a fine sense of pacing, and knows how to generate and release tension over the duration of the piece as well as just in the more obvious undulations of the music. The Sonata No.5 is of a different character, and I do feel Kraggerud is more at home in bringing out the folk-feel of the work, giving the imagination more rain-swept and muddy-boots imagery to play with, against Hadelich’s remarkably fine but more NYC concert-hall touch. To finish this substantial solo programme, Bernd Alois Zimmerman’s Sonata brings us back closer to the Bartók with which we began. This is another violin piece which is uncompromising in its technical demands, seeming at times to cause the player to be in a life and death conflict with their instrument. Not merely a showcase work however, there are plenty of strong ideas going on, ranging from improvisatory explorations to that well hidden B-A-C-H quote with which Zimmerman throws a wink to his grand musical ancestor. This is a superb programme of inspiring music and playing, showing much of the riches on offer from the violin as a solo instrument. It does demand your attention the whole time, but with its well-chosen playing order it is the kind of disc which you can listen to the whole way through without it making you climb any walls.